Here am back with the grand release of our Toggle Mod COMBO, wait... what??? Did I miss something? Yep, it is, Toggle Mod LIVE COMBO v31.0 pal for Mini Militia v3.0.136. Hey, I've released a new update, versioned 32.0 with some awesome new features plus bug fixes supports Mini Militia v3.0.136. Thanks for holding up guys, it's been around a month, since the last release of our beloved Toggle Mod versioned 30.0. I decided to write a robust application, fixing almost all sorts of bugs and you don't believe while I say, the app's now reading and writing patches within a split second. And as you all have waited for this occasion, now you're capable of patching live while running the game, without having to restart it every now and then, for applying new patches. I am sure this update would compensate the long delay. Live Patching Feature - Now you could apply patches, or select whatever in-game feature you want, whilst the game is still running. No more restarts, for each and every new patch. Ultra Fast Code Optimizations - Major part of the reading and writing binary codes are moved to native, low level program. So that reading and writing patches are done within a snap of a finger. All patching bugs fixed - Sometimes even after the patching was successful, the game would crash. Or even, the app would crash whilst the patching process is on-going. All those kinda bugs are fixed.  Upgraded update servers - I've now moved the update checker server to a dedicated one, as of now, the you might not even get a chance to see a "Checking for update" dialog, as the servers are fast enough to serve your requests. (It also depends on your internet speed too). Dual Wield - Fixed a code conflict bug, which caused the Dual Wield option to always visible, whilst being near a weapon. Magic 7x Zoom - A zoom level change bug, which caused the game to crash, if the Zoom feature is not selected in Toggle Mod. Bullet Range - An invalid memory address, which caused the bullets to travel back, when the Infinite Bullet Range is selected. Custom Skill - In some cases, invalid custom skill would be shown, when changed Custom Skill progress in Toggle Mod. Miscellaneous bugs - Lots of other in-game bugs were fixed, which was noted in records whilst bug fixing. 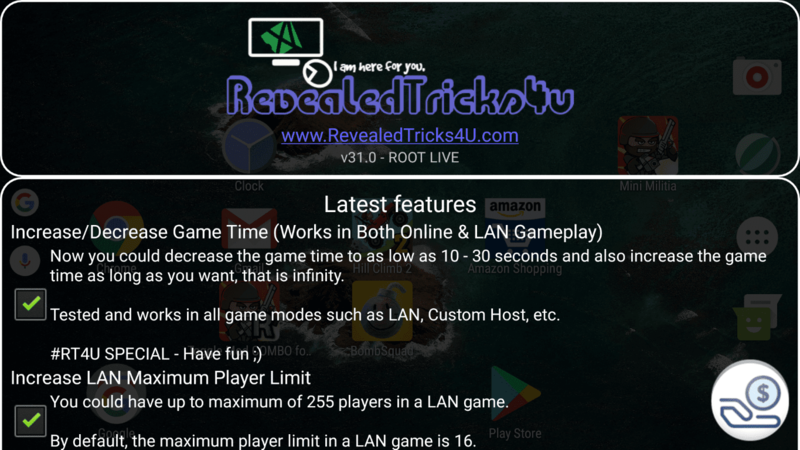 Download Toggle-Mod-COMBO-v31.0-RevealedTricks4U.com.apk (5.99 MB) - Click on Skip Ad after clicking this link, to get the download page. the mod app is just stuck at reading applied patches!!! please fix!!! Live patching is not working for non root..
M using Redmi note 3 with root access. By using new mod it stucks in "reading applied patches.. Please wait..". I uninstalled mini militia and mod too then also the results same. I gave root permission to mod. My game is crashing whenever i try to start the game in custom..i'm playing on moto g4 plus..is there a problem with an update or my phone? Bro its stuck on reading applied patches ! Previous version wirked fine! Please help ..
How do i activate the live patcher buddy. The 'R' logo for live patching is not popping up. Its just showing reading applied patches and doesn't goes ahead how much time this live version takes ? 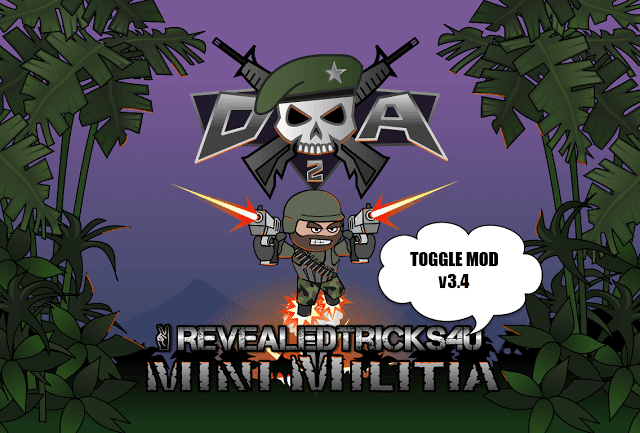 I used v31.0 of toggle mod and v3.0.136 of mini militia. But it only gives a lot of sniper and primary weapon. I want to take all kinds of weapons. Please, help me to solve this problem by a live video with prove. Sir,can you please mod PES 17 gold and credit, please. I waiting for this kind of mod bro. This is working absolutely fine in my non rooted device. will you please update the app with material design. Still crashing me when playing in any lobby after the count down starts..
hey I am just stuck at reqding applied patches. Left it but still stuck at that even after 30 mins. Used to work perfectly on previous versions!